Your home works just as hard keeping you cool through Connecticut summers as it does keeping you warm in winter! And the best way to make sure your home stays comfortable is with a Home Energy Solutions energy assessment. Our energy experts will come to your home and assess your energy systems – not just air conditioning, but lighting, insulation, water heaters, doors, and windows too. Then they’ll make a series of on-the-spot energy-saving improvements that will help your home perform at peak efficiency. You’ll get about $1,000 in services that save the average home around $200 a year in energy bills! Our energy experts will also show you other ways you can save even more with additional improvements. Save 50% on insulation with rebates through the Home Energy Solutions program. And make sure your home is ready for winter. Fill out the form on this page, or call 877-WISE USE to learn more. 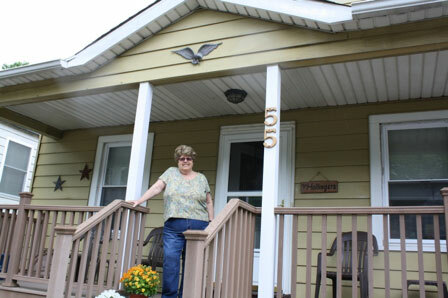 Donna Hollinger of West Haven lives in a home that she estimates is more than 80 years old. Built in the early 20th century with quality materials and a lot of charm, the home was not engineered with today’s energy efficiency standards in mind. However, after receiving a tip and positive reviews from her sister-in-law, Hollinger decided to sign up for the Energize Connecticut initiative’s Home Energy Solutions program to make her home more comfortable while simultaneously lowering her energy bills. Hollinger anticipated Home Energy Solutions would educate her on how to create and maintain an energy-efficient home. She knew that her home had significant drafts, but had not understood the severity of them and their impact on her energy bills. Hollinger inquired about Home Energy Solutions services by calling 1-877-WISE-USE, and just two days later the contractor was performing an assessment at her home. The entire process took only a few hours and created an immediate impact on the sustainability and safety of her home. Roughly five years ago, Hollinger relocated her washer and dryer upstairs so she no longer had to travel to the cellar to do her laundry. During this process a hole was created in her wall to vent the dryer, and this new opening became increasingly drafty. Using a combination of caulk and weather stripping, the technician was able to minimize this draft, amongst others caused by the cellar door and windows throughout the house. The contractor also replaced Hollinger’s showerheads with water-saving models and offered additional recommendations for her to further reduce her energy consumption. One suggestion was to replace the freezer in her cellar with a more efficient ENERGY STAR® model. She plans to pursue this option in the near future. Natural gas and electric heat customers pay a $149 co-pay and oil and propane customers pay a $174 co-pay for the Home Energy Solutions service. Regardless of heating type there is a rebate available for the full cost of the co-pay if a customer completes an insulation recommendation from their Home Energy Solutions technician. Save energy, save money – best of all, keep warm and comfortable all winter long! These services are available free of charge for income-eligible households that need it most. Call to find out how you can start saving today. A Home Energy Solutions energy assessment saves energy, saves money, and helps keep your home warm and comfortable! Call 877-WISE-USE (877-947-3873) or fill out the form below to learn more. Want to get started on saving energy in your home? Here are a few simple ways to get started. Changing your traditional incandescent lighting to LED lighting can save you as much as 90% on energy used for lighting. Wrapping your hot water pipes in your basement with foam pipe wrap is a cost effective way to reduce your water heating costs. Changing your air conditioner filters in your central system or window units will improve performance, improve air quality, and reduce energy use. Using ceiling fans and opening your windows on cooler summer nights will give your air conditioner a break and save money. Keep insulated drapes or shades closed in summer and open on sunny winter days. Energize Connecticut helps you save money and use clean energy. It is an initiative of the Energy Efficiency Fund, the Connecticut Green Bank, the state and your local electric and gas utilities, with funding from a charge on customer energy bills.